Infringement of copyright laws and internet plagiarism is rife and can get any webmaster really angry when it happens to them. Creating original quality content is hard work and to see your content stolen and blatantly copied on another Web site is extremely annoying, but you CAN put a stop to it. Web Hosts, Domain Registrars and Search Engines subscribe to a code of conduct under the Digital Millennium Copyright Act (DMCA) and will assist you in enforcing your rights under copyright laws. Internet content theft and duplications are severely frowned upon and they work actively towards eliminating plagiarism. And of course, you'll also be sending a nicely worded letter to the infringing webmaster to remove your duplicated content. Please refer to the guidelines and an overview of the options available on our Copyright page, We've compiled specific sample letters to use which you can access from there. We actively seek out copyright infringement of our site's content by subscribing to the services at Copyscape. They do have a limited free service but you can opt for a more extensive paid service or a pro-active service where they will alert you to duplicate content. You can also place the plagiarism warning banner on your site to advertise the fact that you use their services. Some webmasters report a reduced incidence of content theft because the banner may act as a deterrent. A simple search can also be done in Google for example by entering a unique phrase of your content (in quotation marks) to see what crops up. Use of the Copyright Symbol - HTML Symbol. You can create the HTML copyright symbol by typing "& copy ;" (without the quotation marks and spaces) or on a PC by holding down the Alt key whilst typing the numbers 0169. Use of the copyright symbol is not mandatory but it may alert (educate) potential infringers to the fact that you are claiming your rights. You can also add the words "all rights reserved" in your copyright notice. 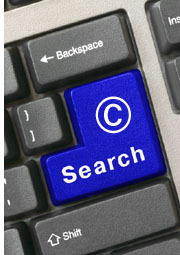 Your rights under copyright law are automatic and no registration is required. 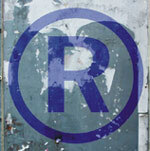 Registering does have some advantages though which are discussed on our main page on Copyright Law. Work published on the Internet, be it content, graphics, forum posts or whatever may be publicly accessible but that does not mean it is in the public domain. Generally speaking, copyrighted work enters the public domain (owned by the public) roughly 50 to 70 years after the death of the creator, unless the holder of the copyright in a work declares it "in the public domain" before that. All copyrighted work on the Web (unless declared otherwise) is therefore protected by copyright laws and internet content may not be reproduced without explicit authorization from the copyright owner. Under a Creative Commons licence an author can grant permission to copy, alter, share etc. a work provided the conditions as specified are adhered to. Domain names cannot be copyrighted. It may qualify as a trademark which is protected by trademark law. Facts, ideas or a list of ingredients for a recipe does not qualify. Your original description of the cooking process or expression can be protected though.